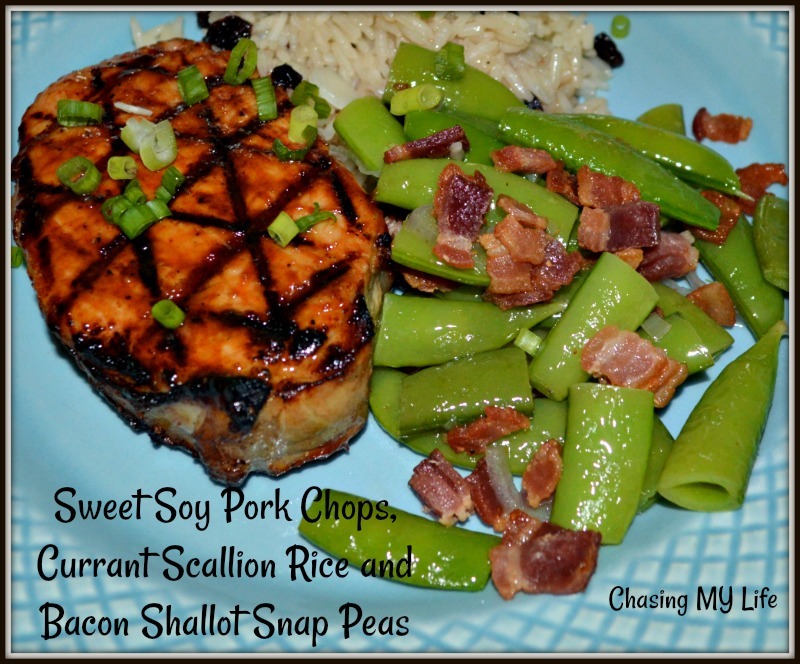 This dish has progressed over the years for me with flavor changes and updates. Grams used to call it “CONTINENTAL” chicken for a reason I will never know. LOL 🙂 But, it’s just a sturdy chicken and rice that serves a family well. In a shallow bowl, whisk together the avocado oil, parsley, paprika, garlic, thyme, salt and pepper. Add the chicken pieces and coat each piece evenly with the seasoning. Set aside, allowing the flavors to absorb into the meat. Spray a large baking dish with nonstick cooking oil spray and set aside. In a medium mixing bowl whisk together the broth, water, salt, oil, garlic. Add the onion, garlic, oil, Stir well to combine. Mix in the onions and rice. 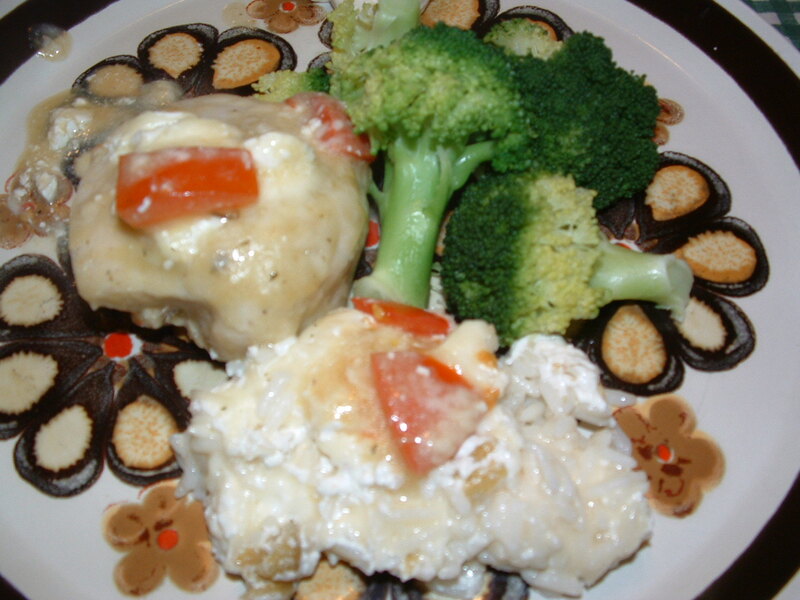 Arrange chicken in a single even layer over the rice, cover with foil and bake for 40 minutes. Uncover and bake for an additional 15-20 minutes, until the chicken is cooked right through to the bone. 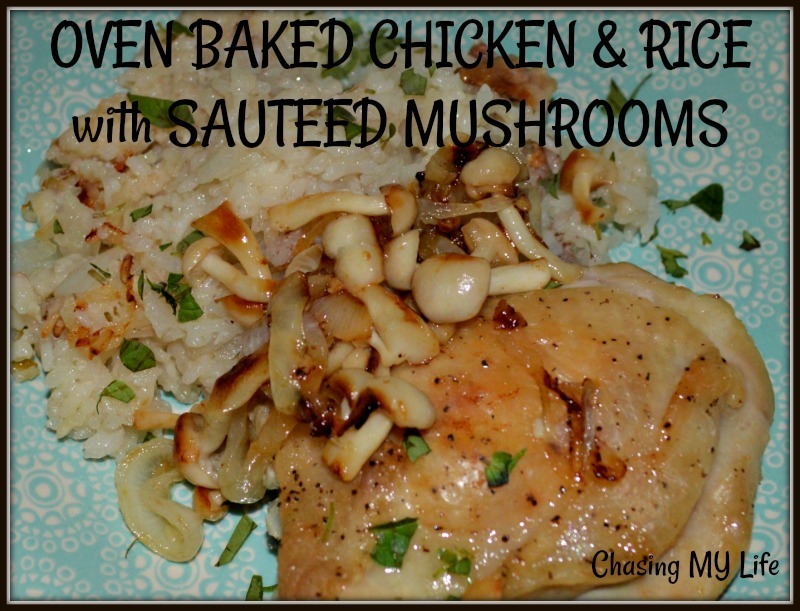 Change oven setting to broil for 2-3 minutes to brown the chicken and crisp rice. When chicken and rice is finished cooking, allow it to rest for 5-10 minutes. Heat butter in a pan over medium-high heat. Sauté green onions and garlic until fragrant (30 seconds) and add mushrooms; cook until softened. Stir in 2 tablespoons of chives and season with salt and pepper. Transfer chicken onto a plate; fluff rice with forks, then mix the mushrooms through the rice. Arrange chicken back onto the rice in the dish, garnish with remaining chives and chopped parsley. NOTE: If you prefer using chicken breasts or boneless thigh fillets, add them in after 20 minutes dish has been in the oven. The bone-in pieces tend to stay juicier and more flavorful. Whisk together the liquid aminos, vinegar and sriracha. Turn chops to coat well with marinade. Marinade at room temperature for 30 minutes, turning bag half way through. Prepare glaze while grill is heating. Generously season pork chops with salt and pepper. Brush each side with glaze. Grill about 6 minutes per side. Brush with additional glaze and serve immediately. Combine water and consommé in sauce pan. Add rice, stirring to coat. Reduce heat and simmer 15 minutes or so until tender and moisture is completely absorbed. Fold in currants and green onions. Heat bacon grease over medium high heat. Add shallots and cook 3-5 minutes until browned. Add snap peas, consommé and season with salt and pepper. Saute’ covered 2-4 minutes until crisp tender. Uncover and continue sautéing until all liquid has been absorbed. Stir in lemon zest, lemon juice and bacon pieces. 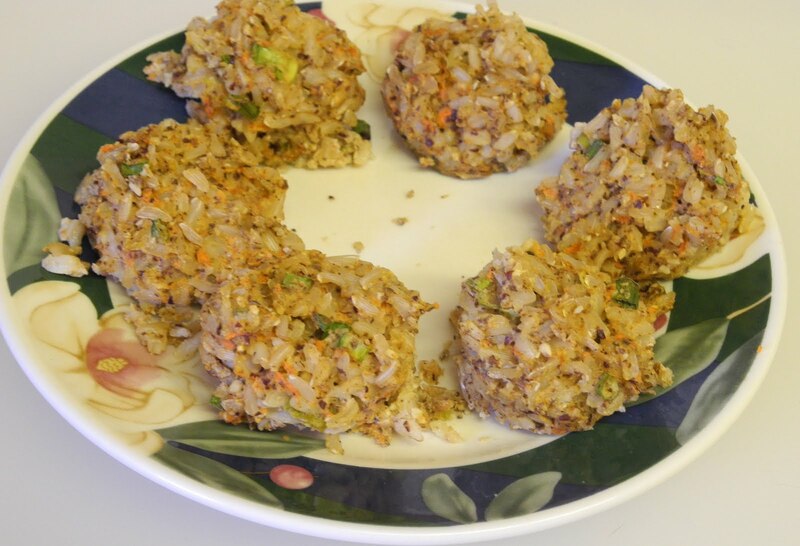 I found this recipe made for shrimp, but it is ALSO awesome with chicken. 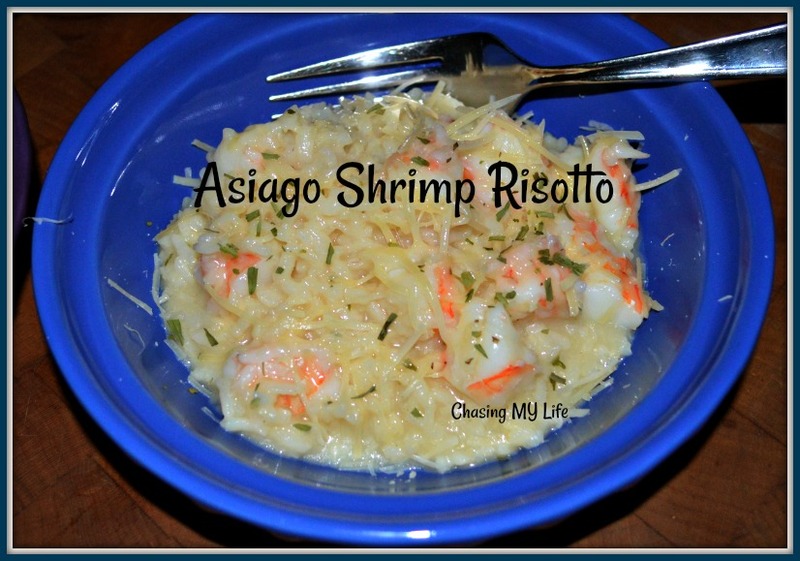 ASIAGO SHRIMP RISOTTO adapted from What The Fork’s for Dinner? In an electric pressure cooker set on sear, melt 3 tablespoons butter over medium heat. Add shallots and garlic, sauté until translucent, about 4 minutes. Add rice and cook, stirring, 1 minute more. Add wine and cook until wine evaporates, about 30 seconds. Add 3 cups of chicken stock and lemon juice; season with salt and pepper. Set pressure cooker on rice setting for 10 minutes. Vent pressure, then remove lid. Stir in cheese and remaining 1 tablespoons butter. Finish with herbs and serve immediately. NOTE ** If using chicken use 1 pound cut into small bite sized pieces and adjust cooking time until chicken is cooked through. I have also prepared chicken in a skillet getting a good sear on all sides before adding to risotto and then only stirring to coat well with sauce. Heat 1 tablespoon of oil in large saute’ pan over medium high heat. Add sausage and brown about 5 minutes. Remove with slotted spoon to a plate and cover. Add chicken pieces and brown on all sides. Remove with slotted spoon to a plate and cover. Add fennel, onions and bell pepper to pan sauteing until fennel softens. Stir in garlic, paprika, salt and saffron, stirring until fragrant and sizzling. Add tomatoes and cook, stirring 5 minutes to blend well. Add rice and coat well. Add water, chicken broth and sherry. Cover and bring to a boil over high heat. Reduce heat, cover and simmer until rice is tender and liquid is absorbed, about 25 minutes. Arrange chicken and shrimp on top of rice, cooking another 5 minutes covered to heat chicken and shrimp through. Garnish with fennel fronds and Enjoy. I love Asian food, using up leftovers, and cleaning out my fridge. A wonderful and versatile dish, stir fried rice, does all three with ease and delight. Heat oil in wok or fry pan over medium high heat. Cook minced garlic until translucent, approximately one minute. Add vegetables, brown for 1 minute while stirring with spatula. Cover with lid to steam for 2-3 minutes. Add cooked rice and mix ingredients, allow to heat through. 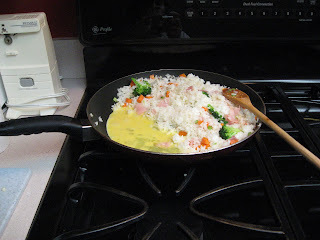 Add diced ham, stir ingredients thoroughly, and then push rice mixture to one side of pan. Use this open area to scramble the beaten egg. After the egg is scrambled, stir into rice mixture. Add the sauce to pan, stir fry for another minute until bubbling and hot. Sprinkle toasted nuts prior to serving. 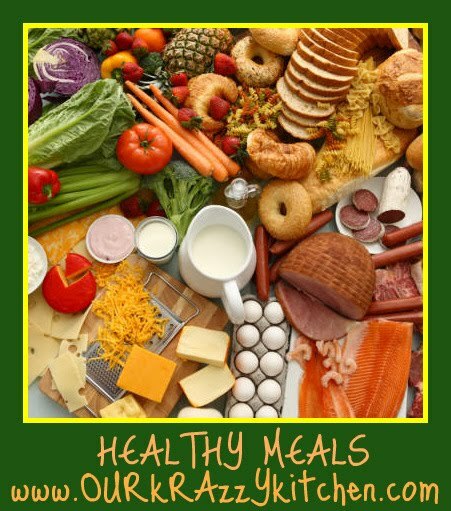 Other ingredient suggestions include tofu, pineapple, leftover pork, chicken, or steak, peas, corn, water chestnuts, bamboo shoots, and whatever else you have in your pantry, freezer, or refrigerator. *Drained and defrosted frozen vegetables can also be used. 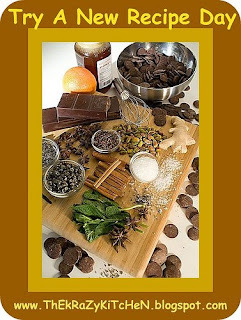 Thank you so much and what variations and ingredients do you enjoy? One of my favorite go-to meals. For those days when you haven’t really made any real plans for dinner. I always try to keep sage pork sausage in the freezer. It is quick to put together and cooks for the most part, in the oven. Serve with a side salad and bread and you have dinner. Try not to skip the pecans they make the dish. 1. 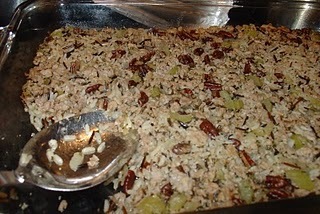 Heat 1/2 cup chopped pecans in a large nonstick skillet over medium-low heat, stirring often, 5 minutes or until toasted. Remove toasted pecans from skillet. 2. Brown sausage in same skillet over medium-high heat, stirring often, 10 minutes or until meat crumbles and is no longer pink. Remove sausage from skillet using a slotted spoon; reserve drippings in skillet. 3. Melt butter in hot drippings over medium heat. Add onion and celery, and sauté 10 to 15 minutes or until celery is tender. 4. 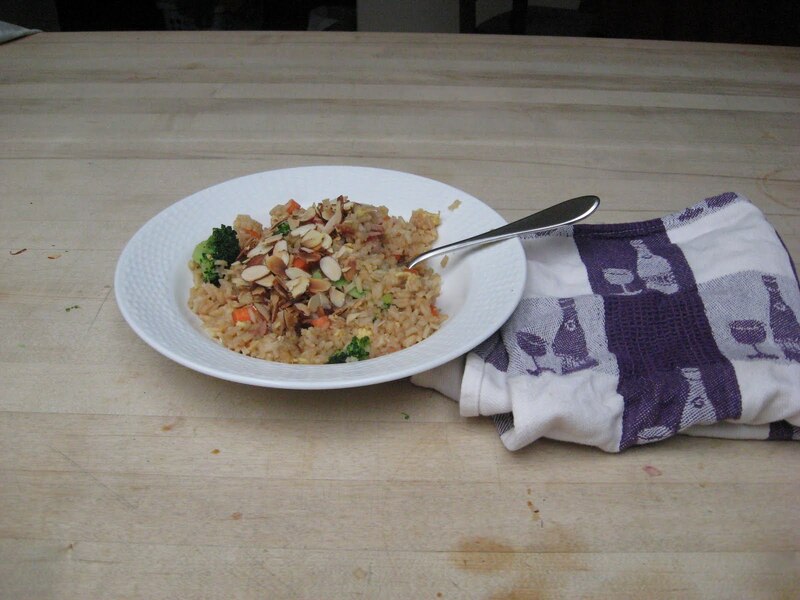 Remove 1 seasoning packet from rice mixes; reserve for another use. Combine sausage, vegetable mixture, remaining seasoning packet, rice, and next 3 ingredients in a lightly greased 13- x 9-inch baking dish. Stir in chicken broth until well blended. 5. Bake, covered, at 325° for 1 hour or until liquid is almost absorbed. Let stand 5 minutes. Sprinkle chopped pecans on top. 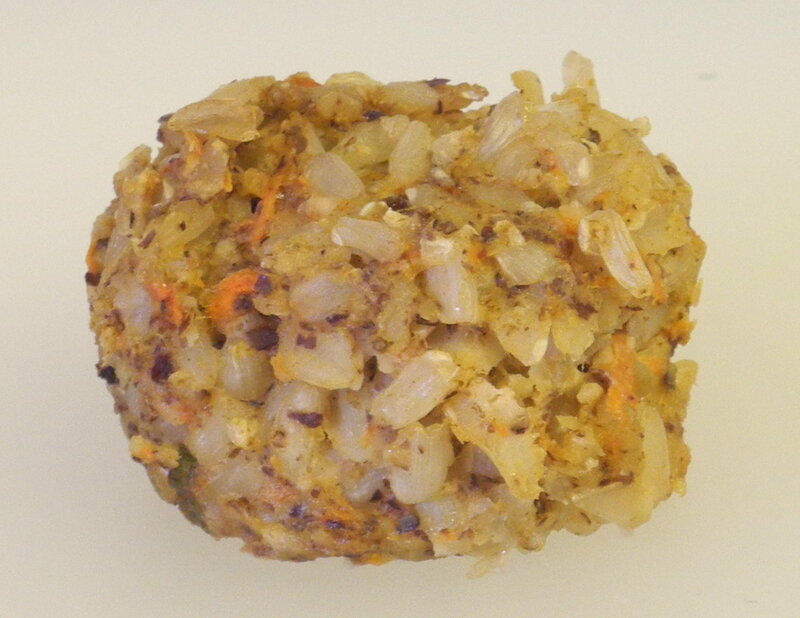 Hundreds of thousands of years ago, I made a recipe for vegetable burritos that came from a recipe pamphlet from RoTel. Okay, carbon dating and fossil records show it was actually just over 15 years ago. We loved it back then and thought it was an impressive recipe. That was back when I was just learning to cook for Alexis and my new family. Tonight we dragged this one out of the archives and upgraded it to how we would have made it now compared to back then. Cook your rice according to directions. Grill the green onions just enough to get a slight browning on them (about 1 min a side). 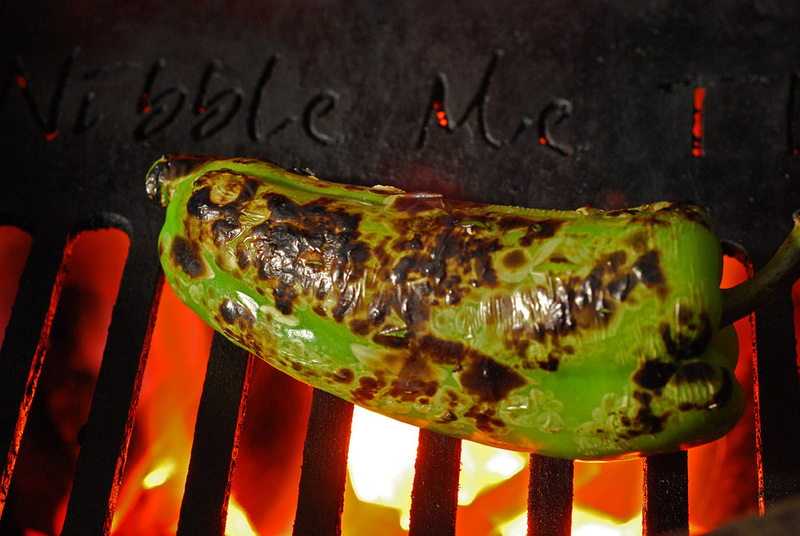 Fire roast or broil your peppers until blackened on all sides. 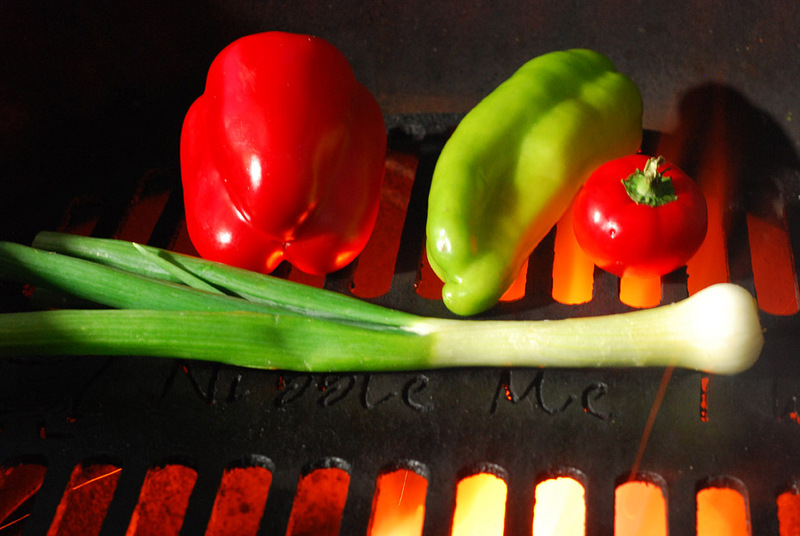 The fire roasting brings out the best of the veggies. Don’t be afraid that they are “too charred”. That makes them easier to peel and won’t affect the final flavor. This one wasn’t done enough yet, just to give you an idea. Place the peppers in a plastic zip top bag, they’ll steam on their own for 5 minutes. Cut the ends off each pepper and slice down the length of one side to open them up. Remove the seeds from the inside. Flip and lightly scrap the charred skin off with the sharp edge of a knife. As soon as the rice is finished, stir in the green onions, red bell pepper, and cubanelle/poblano pepper (reserve the cherry pepper for the cheese sauce). Stir in 1 cup of the cheese and the serrano pepper. 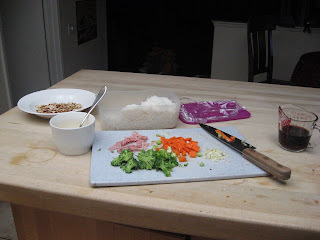 Taste the rice mixture for seasoning and add salt and pepper as needed. Spread about 3 Tbsp of refried beans on the tortilla. 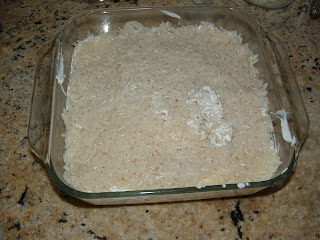 Top with 1/2 cup of the rice mixture. Sprinkle more cheese and 3 Tbsp of salsa on top. 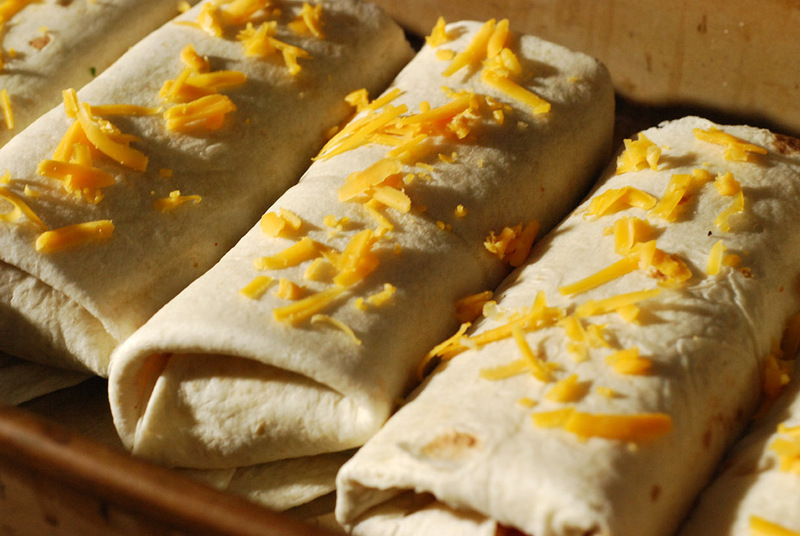 Roll up burrito style and place seam side down in a casserole dish. (Click here for a photo tutorial of how I fold mine.) 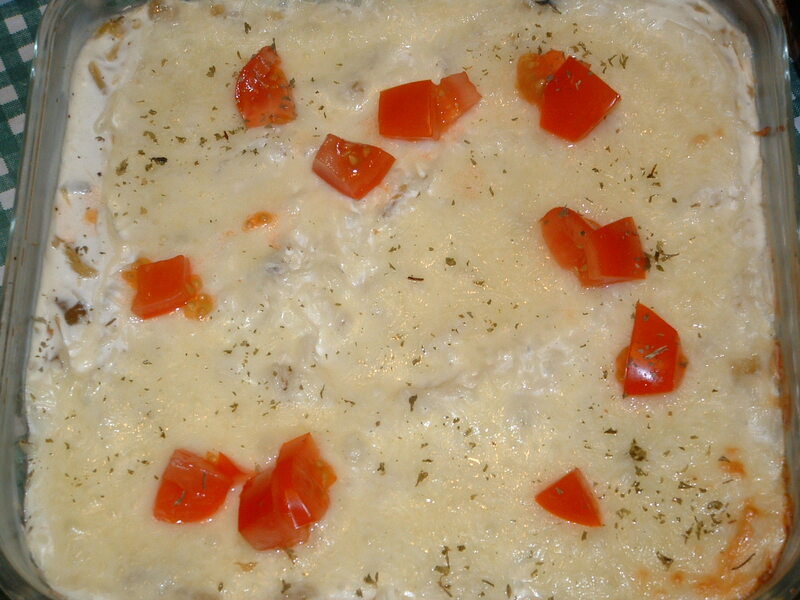 Top with a few sprinkles of more shredded cheese. Place the dish in your oven preheated to 350f (or in our case, a grill set up at 350f for indirect heat) and cook for 25 minutes. Cut the queso cheese into 1/2″ cubes and put into a small sauce pan. Add the milk, cilantro, and diced cherry pepper and warm until melted over medium/low heat. 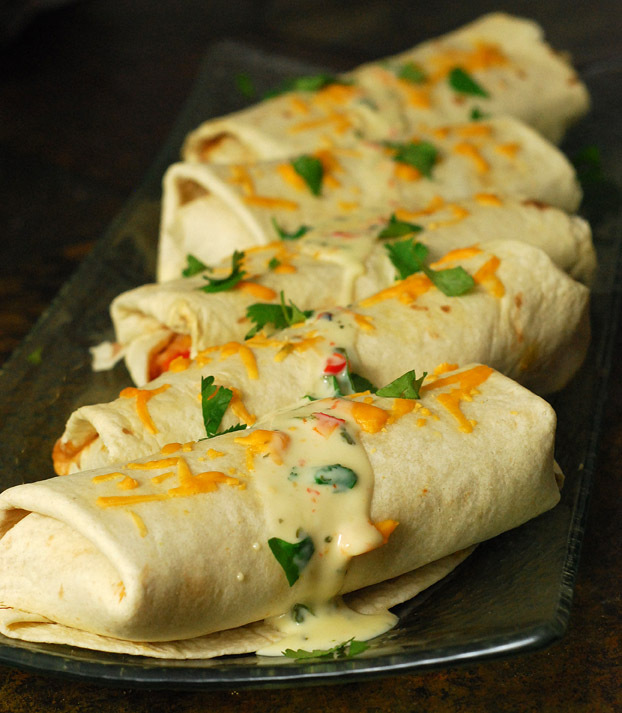 Serve the burritos with the sauce poured over the top or on the side. Don’t let the minimal amount in the picture fool you. As soon as the pictures were taken and my burrito was cut up, I ladled a good bit of that queso sauce all over my burrito! In case you’re interested, here’s the original version. It’s a lot easier and still good. preheat oven to 350F. Spray a 9x 12 x 2 baking dish w/ spray. In medium saucepan, combine Rotel, rice & water. Heat to boil, reduce heat, cover, & simer 1 minute. Remove from heat and let stand 5 minutes. Stir in pepper, onions and 1 cup cheese. Spread 3 table spoons beans over each tortilla. 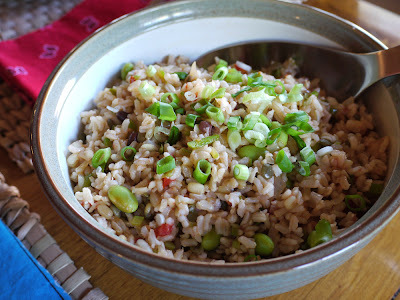 Layer rice mixture over beens and sprinkle on more cheese & salsa. Roll up and place seam down in prepared baking dish. Cover w/ foil. Bake 25 minutes. In a medium-sized saucepan, bring the water to a boil. Add 1/2 teaspoon salt. 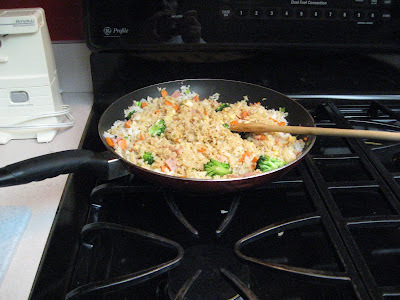 Add the rice, cover pan, and slowly simmer over low heat until the liquid is absorbed, approximately 30 minutes. Let the rice cool. 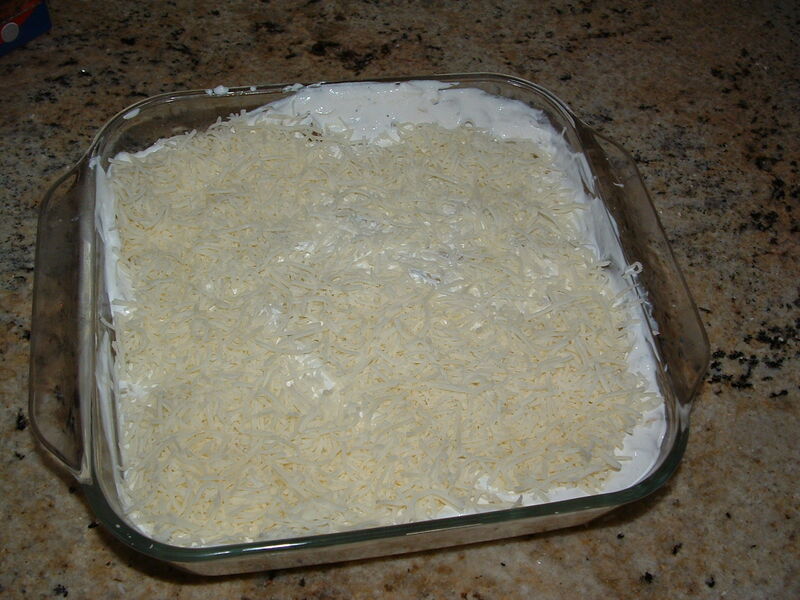 Mix the cooked rice with the sour cream, chiles and salt. Mix together the 2 cheeses. In the bottom of a greased 1-1/2 qt casserole, spread half the rice mixture. 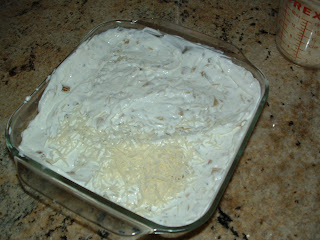 Sprinkle with half the grated Jack cheese mixture on top and then add the rest of the rice. Top with the remaining Monterey Jack cheese mixture. Dot with butter. I also added a chopped tomato for color. Bake uncovered in a preheated 350 degree oven for 30 minutes.Serves 8. 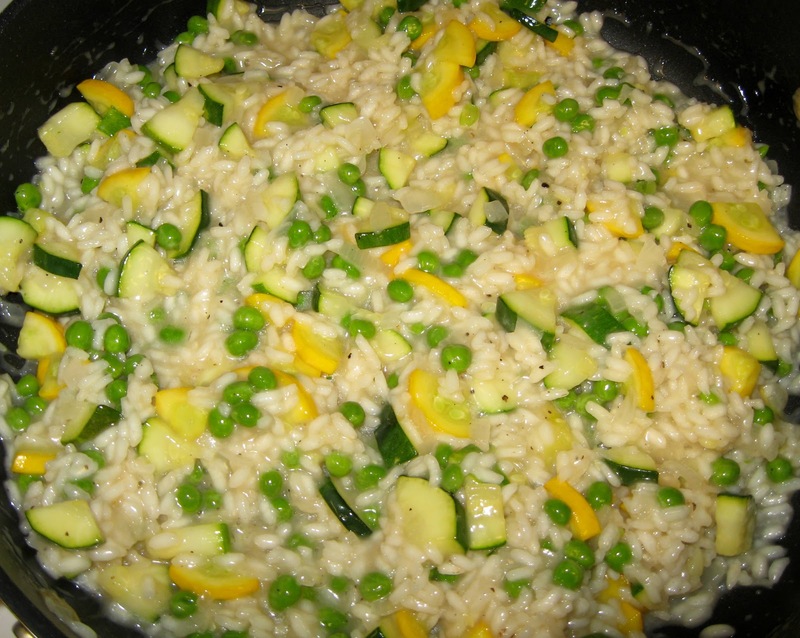 I love risotto but I’ve never made it. I’ve seen a ton of recipes for it and have been tempted. But never made it. Peas are not a vegetable that you’ll see a lot of from me. My husband hates peas. Like, “file-for-divorce-if-you-make-peas” kind of hate. So needless to say, we don’t eat a lot of peas. I happen to LOVE peas but clearly don’t get enough of them. So I saved this recipe for when he was at work! I hid the leftovers in the back of the frig and ate them for lunch the next day before he ever knew they were made. It turned out perfect and was delicious! 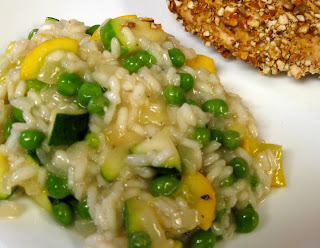 We ate this with a Honey Mustard Chicken with Pretzel Crust which paired nicely with the risotto. I will for sure make this again. – When the husband is gone again, of course! This is linked with Works For Me Wednesdays over at We Are THAT Family. Also linked with Foodie Friday at Designs by Gollum. In a saucepan. heat the olive oil on high. Add the squashes, saute for 2 – 3 minutes. Set aside. Melt the butter in a heavy large saucepan over moderate heat and add the onions, sauteing them for about 3 – 4 minutes, then add the rice, stirring until it is well coated. Add 1/2 cup stock and cook, stirring constantly until the stock is absorbed. Continue adding stock, about 1 cup at a time, stirring frequently. By the time most, or all of the stock is added, the rice should be tender but still firm, the mixture creamy. Add the reserved zucchini, squash and peas and cook until they are heated through. Remove from heat and stir in lemon juice. Add salt and pepper as desired. 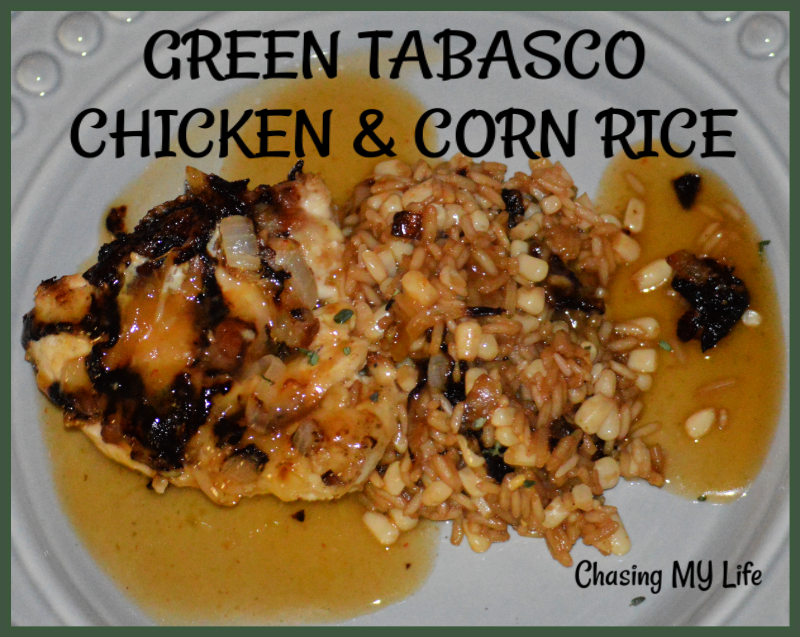 Check out my Honey Mustard Chicken with Pretzel Crust on Debbi Does Dinner Healthy!